I was choosing the photos for today's blog post when I realised it's mostly about food production in the Reynolds kitchen, and that's what happened in my kitchen last Monday as well. Hmmm, so I may have slipped right into a nice little Monday routine - without even trying. I quite like that. Actually it began yesterday when Blossom and Cully came to spend the day with us. The visit had been planned and postponed a few times so I kind of 'let it go' in my mind until she rang early Sunday morning to ask if it was okay for them to come over after breakfast. Naturally, my heart went aflutter as I replied with a resounding "yes!". But what to feed them? 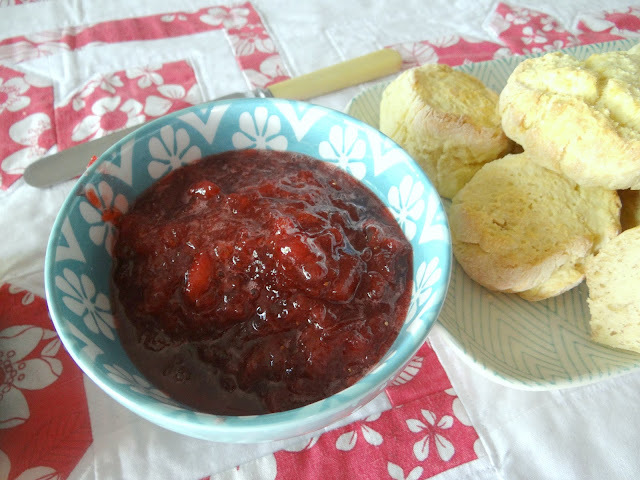 We'd come to the end of last week's fare and I didn't have time to bake fresh bread or cake, so I decided to bake a simple batch of scones and prepare some super quick homemade strawberry and apple jam. 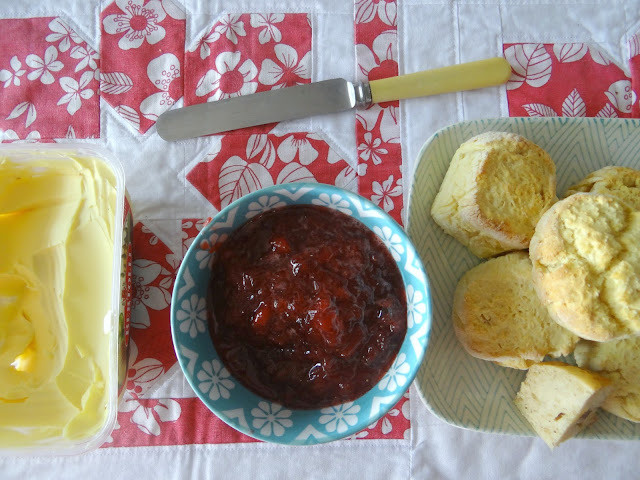 Both the scones and the jam only took 20 minutes from start to finish. Even though this was a simple meal together it was a joyous time of laughter, conversation and problem solving. If I'd tried to go 'big' and create something amazing we'd have missed a lot of that heart-to-heart time. 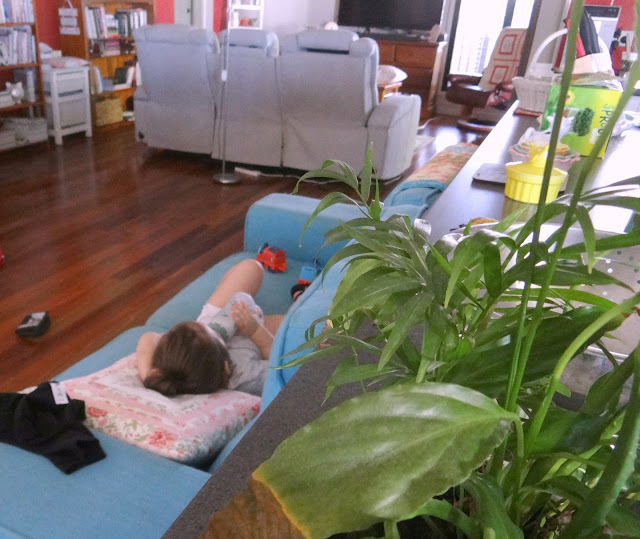 Cully enjoyed our family morning tea and then after a play with Pop and a few laps of the kitchen island on her Thomas the Tank ride-on she lay on the couch with her bottle and fell fast asleep. Years ago I wouldn't have made jam until I'd purchased an abundance of ingredients on sale, had a plentiful supply of clean empty jars, and at least half a day up my sleeve to spend in the kitchen. Now to be honest that usually happened once or twice a year at most, and some years there was no jam making at all because I couldn't line up the three requirements - cheap fruit, glass jars and time. But then I had a change of attitude. If all I have on hand is one punnet of strawberries (250g or half a pound), one green apple, a little lemon juice and 150g sugar, I can make jam. This jam recipe makes plenty for a week's supply to top scones, pikelets, bread and toast. It's twice as much as I need for my Strawberry Shortcake or to fill the centre of a Matrimony Slice. It's also just the right amount for the two of us at home, even if a few visitors pop in. As much as I'd like to prepare a pantry full of different jars of fruity jams, that's just not possible most of the time, so when needs be I use what I have and delight in the making as well as the delicious taste! You can replace the strawberries with any other berry and you don't need pectin or Jamsetta as the apple and the lemon juice thicken it naturally. You don't even need a jar as it will all be gone in a week...or less. I must admit to licking the bowl clean, says she with sticky red cheeks from the remnants of thickly buttered and strawberry jammed bread for 'afters' this evening. There's a wonderful freedom in making do as you work with what's on hand, whether that be in the kitchen, the sewing room, mending, or dressing for a trip to town. Choose to go with the flow of the day and enjoy the process of making, creating, being, and living in times of scarcity as well as plenty. You know, homemaking doesn't always need to be large scale. When you're time poor and rushing home from work or an unexpectedly long day of commitments, don't feel bad if you need to stop by the supermarket and grab a rotisserie chicken for the family's dinner. Just breathe when you get home, slip into some comfortable clothes and gently change your thoughts from the busyness of the day to the joy you feel in the sanctuary of your home. Light a candle and place it in the centre of the table. Prepare a simple healthy salad with everyone's favourite dressing, and slice some bread. Fill a pitcher with water and slices of lemon. Bring all this to the table, along with the chicken, and tell those who gather around your table that you love them, that you're so happy to be home with them. Maybe it's just you and your husband, or you and your pet. You can still light that candle and set the table in a way that fills your heart with joy. Put some music on in the background...relax. Homemaking is much more than sweeping floors and ironing shirts. Those things are very important, but they are one small part of the whole experience. Homemaking can include adding touches of life to the mantle with green sprigs and tulips in Spring, displaying your handwork in order to bring colour into a dull or empty space, fresh crisp sheets laid out on an aired mattress, coffee in the quiet of the morning as you look out over your garden, the aroma of a home cooked meal almost ready to serve as the sun is slipping below the horizon, watching your loved ones relaxing in the home you've been caring and preparing for them, welcoming guests who need a bed for the night, reading to a sick child or an elderly relative who is losing their sight...and so much more. Homemaking is every aspect of making a house a welcoming, safe and hospitable home. We once again found the garage sales on Saturday 'very slim pickings', however I did come home with a wonderful large stainless steel colander, the old kind, the one your Nana (and mine) had. 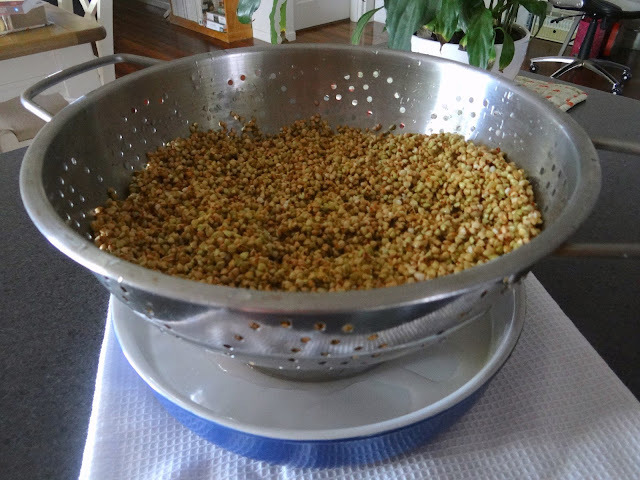 I used to make my own sprouted buckwheat granola for years but the big plastic colander I had broke a while ago and could not be repaired. Raw buckwheat groats must be soaked for about 15 minutes and then drained and left to sprout in a large colander for a couple of days (rinsing often) so as much as I was tempted I did not buy another plastic colander but kept my eyes peeled for a stainless steel one at op shops and our regular treks around the garage sales. Now my marvelous $5 colander has me back on track with making gluten free granola for our breakfast! On the way home from hunting down bargains in other people's yards we dropped in to Bunnings for some indoor plant food, but we left with a sprouting kit as well. This is not for sprouting the huge amount of buckwheat I need for granola, but for salad sprouts. 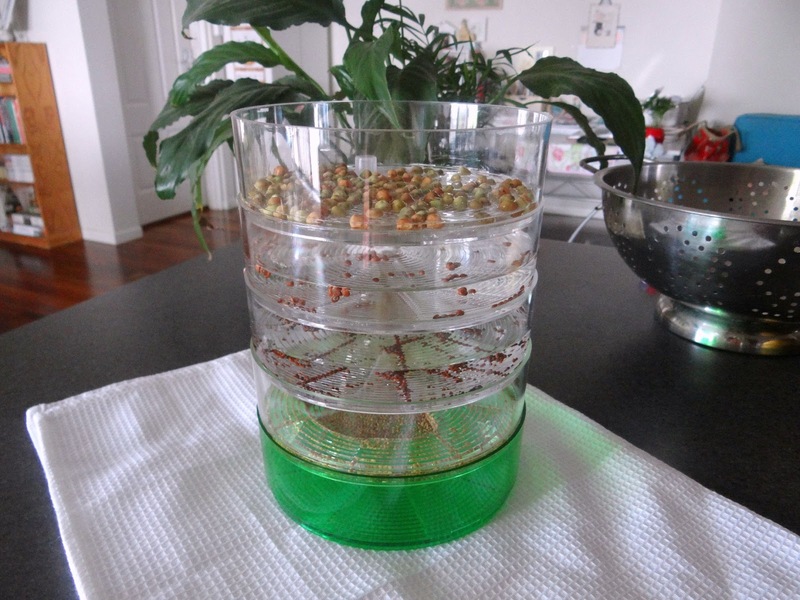 It's really neat and fits nicely on the kitchen bench where I can harvest my sprouts easily each day. We've started with snow pea, broccoli, radish and alfalfa sprouts. 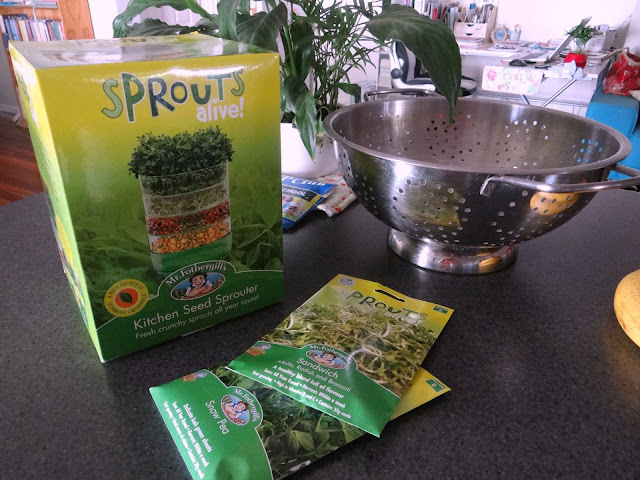 The instructions suggest 1 tablespoon of sprouts in each level, but as there's only the two of us I halved that so I can make sure we're using them all and not wasting seeds or sprouts. We had our first walk through prospective buyers last Friday and though it was uncomfortable, it wasn't bad. The estate agent had told them we would not be breaking our lease and would be staying put until September so although they liked the house they're looking for a home to live in, not an investment property. I had woken that morning pretty sick with an infection so headed straight to the doctor for antibiotics. I think I've only had them about ten times in my whole life so they worked fast and I am feeling much better today, but on Friday the last thing I felt like was strangers coming through our home. But God is good, so good. They were kind, understanding and polite so I prayed they would find the perfect home for their needs. Tomorrow I have my mammogram and afterwards I'm going to write a post about simple gift giving ideas. Last week I made some gifts to put away for birthdays, Christmas and 'just because' so I'm feeling quite accomplished at getting a start so early in the year. I'll also show you how I "framed" the free stitchery I shared the other day. I have been jam making too! I have plums! I am so excited. I made some yesterday and a few more jars tonight. The I am in op shops I watch of the really cheap glasses. You know the odd ones? I get these for jam for when my actual jars run out. With the cellophane tops they refine for jam, some are really pretty and look gorgeous! Cully is growing up so fast! I'm glad you had a nice visit. 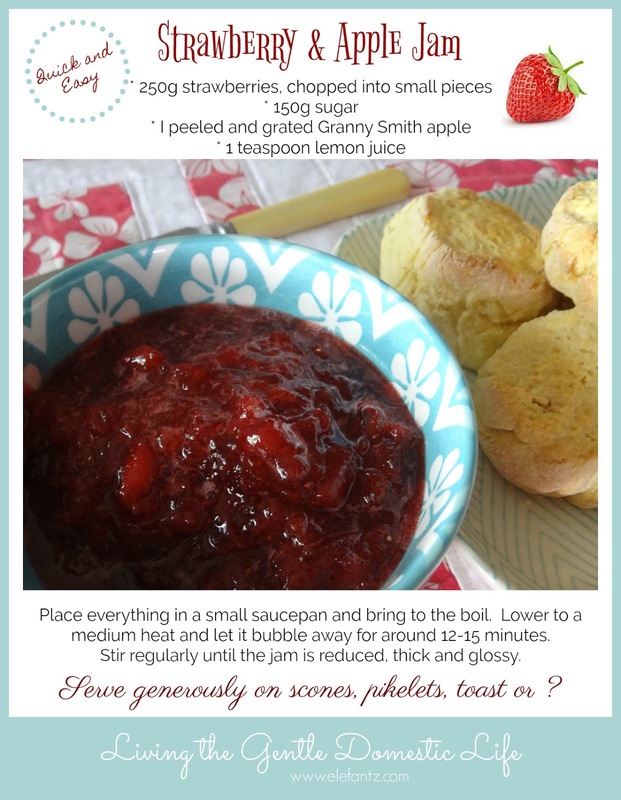 I would have never thought of making a single batch of jam either.It looks delicious! One of my favorite things to do when I know I'll be home alone, is to stop for some take-out and bring it home, put on my jammies and curl up with my dinner and a good book - that's homemaking on a micro level, lol! But it works! Hope all is well with Blossom, sorry to hear you're under the weather hon, but glad you're back on track...glad too that the home visit went well. I have never tried to make jam, but you made it sound so easy! I will give it a try sometime! Hello Jenny; I enjoyed everything on your post today! I have never made jam or jelly, but my husband does and has a great time doing it! Cully sure is growing up, she is so adorable and beautiful! I always love hearing about your family times together. I do not do the healthy the way you do, but I have a couple daughters who do and I am going to try and find them a starter kit like you found for a gift. They would be so excited, I know they would squeel and do a happy dance plus give great hugs! Like you, I am going to create gifts all year long this year and I am going to start with one for Deanna (my quilting partner). Thanks for sharing everything and have a fantastic day! Ah, Jenny you are a wonderful treasure. I always have a smile on my face as I read you blog whether it is fast because I want to fit it into my day and don't want to miss it or slow with a cuppa in my hand. Darling Cully May tuckered out on the sofa is a lovely picture. I'm so sorry you are under the weather...especially with having people traipsing through your home! Neither one is any fun. Great idea to make just enough jam to last the week...you are so smart!! I've done the whole-day jelly and jam making and really love homemade jams and preserves (jelly, not so much) - so much thicker with fruit then the store-bought ones. It is fun to make freezer jam with my girlfriend, but your recipe is perfect for me to do at home. I'll have to try it with the blackberries I have right now. Praying for you, my dear friend! When my life was so simpler I used to make jams and jellies and preserves all the time. I loved to se al my things in my pretty canning jars in my pie safe pantry's. Those were the days. How I often wish I could go back in time. Your jam looks delicious. Those were the best years of my life. I probably didn't think so at the time. But looking back now. I know they were. Hi Jenny! I like to make quick jam with blueberries. Yum! So glad the first house showing went well. Fear of the unknown is dreadful. Praying the house sells quickly so you can relax until September and not have people coming in and out. Keep the faith. Lovely post...love the jam recipe, going to try working with it to make it diabetic friendly...But I have a question...any chance of your sharing your recipe for your sprouted granola? Sprouting the grains seems to help with keeping my blood sugars in check and having a granola alternative than oats every day would be great! I have never made granola, and store bought is nothing but sugar! I love this! Small and simple things are so often the better choice. You most likely could have come up with something far more complex and time consuming. But, that takes a lot of energy. That precious gift of energy could have been spent on a task or on family. Obviously, the task is forgotten. Bit those sweet memories last forever and strengthens the familial bond. The food looks delicious. It sounds like a wonderful, productive visit. As always, your blog is such a calming, lovely and peaceful place to visit! I enjoy it very much. I'm now working on my second "Vintage Kitchen" wall hanging. 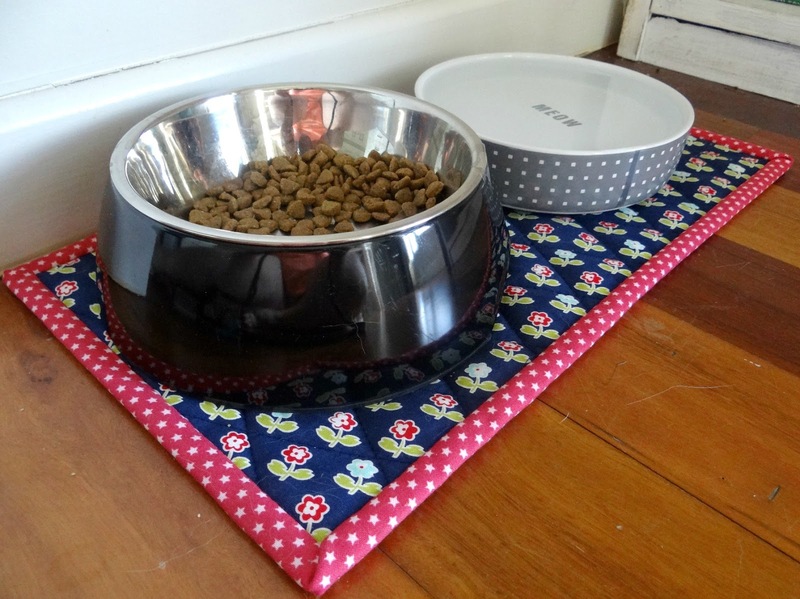 (pattern from your shop) I couldn't find the wooden "Kitchen" to hang it from like you used, so instead I used a rolling pin. It turned out very lovely. Would you care to share how you sprout buckwheat and then also your granola recipe that you use? I'd love to know how to do that. This past summer (2017) I made grape jelly, and plum jam. All from home grown fruits we grow here. We also have a fig tree, but the birds get all the fruit. 😬 We also have two pear trees, but have only gotten one pear from them. Two peach trees, but the fruit rotted on the trees. We have tried to grow apples 🍎, but they just won’t live here. We live in the US, in the Easternnpart of Texas. I’m hopi g to have a garden this year so I can put up some home grown vegetables this year. I love canning. And dehydrating what we grow. We are in for a winter storm with 2-4 inches of snow. It’s gonna be cold! Oh, and we rarely get any snow in East Texas. Love reading your posts, and all of your patterns and recipes.